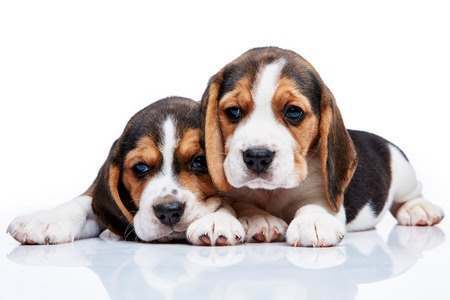 The Beagle dog breed is a favorite breed of friendly, affectionate and energetic family dogs. They are known primarily for their friendliness and small size, making them not at all aggressive, and great for people of all ages. Beagles are known as pack dogs, used to living and hunting in packs they are more accustomed to the company of other canines or people. It’s not uncommon to see a Beagle cozying up to a guest in the house. A Beagle will often be seen with its head down while it walks. This is because Beagles are scent hounds, known for being especially sensitive to different smells. They will often be looking for a new and refreshing scent to investigate, as they have upwards of 200 million more scent receptors than we do. That’s a lot of distracting smells, but for a Beagle, the more, the merrier! Beagles can be a bit of a hassle sometimes. If they get bored, they will find something to occupy themselves. Beagles’ form of entertainment usually involve things like barking and howling, digging, or exploring where they shouldn’t be. Getting toys for a Beagle and playing with it can help quell this behavior but if nobody is at home during the day, it may be worth hiring someone to walk the dog or sending it to a doggy day care. 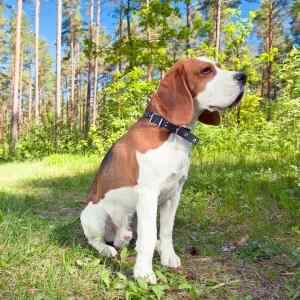 A Beagle’s tendency to explore can become problematic for the owner. Some sort of enclosure is recommended for these dogs. Invisible fences can be used, but are not as effective as solid fences because they do not keep other animals or people from entering the enclosure. In spite of all these precautions, it is also suggested to implant a microchip to track a Beagle, just in case. It is important to maintain a Beagle’s energetic personality, as their excess energy may just go into digging or chewing on various objects in an owner’s home. Regular exercise can help control their erratic and driving behavior. The exercise does not have to be fun for the dog alone, like playing with a Beagle can help satisfy its energy needs and be entertaining for the owner. Beagles are more than just family dogs as they continue to serve their original purpose as hunting dogs. Their phenomenal noses are no doubted an asset to a hunter, assisting by tracking game by scent. Their barks and bays were also used to drive game from where they resided, making them easy targets. Their specialized applications go far beyond hunting and companionship as Beagles are used in many important jobs. Their heightened sense of smell has been utilized by law officers throughout the country, sniffing out deftly disguised contraband in airports and elsewhere. 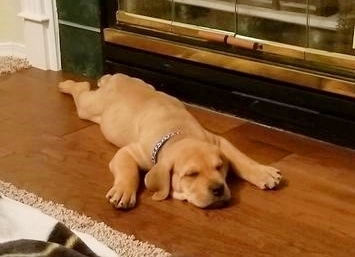 Beagles have also been used in searching for people, like the bloodhound, their noses are used in hopes of picking up the scent of the individual of interest. The Beagle dog breed is a very vocal breed, howling, barking, and baying. While this is just natural for them, some people do not take kindly to a dog that is this vocal. Beagles are not ideal dogs for people that are or live near/around people sensitive to high volumes. It is also important to take into account the environment a Beagle may be living in, as frequent visits from wildlife or people are bound to cause a cacophony of noise. A lack of appetite is not a problem for a Beagle, as they love to eat. Don’t try to take it away from them or tease them with it, however, as they are very defensive of their food. This love for food can become unhealthy, as they are prone to overeating. It is important to feed a Beagle the right amount of food as well as supply it with ample exercise as they are prone to obesity. It was in England in the early 1500s when Beagles first began to gain popularity, as Queen Elizabeth I created a fad by keeping smaller Pocket Beagles. These Pocket beagles supposedly had a height of only 9 inches, making them not very good hunting dogs. In later years, Beagles gained a reputation as small game hunting dogs, in close competition with the Foxhound. Before the rise in popularity of the Pocket Beagles, there was supposedly a little breed of Beagle known as Glove Beagles.The Glove Beagles were owned almost solely by nobles, most notably Henry the VII and Edward the II. They were rumored to be small enough to fit in a person’s hand, although this may be an exaggeration. In the 1700s the Beagle lost its popularity, as the Foxhound exceeded it in its capability to hunt, you guessed it, foxes. However, where it fell short of hunting foxes, the Beagle was uniquely capable of hunting rabbits. Farmers in England, as well as Ireland, kept the breed going by using them to hunt such small game. It is possible that the Beagle and the Foxhound may be descended from the same dog breed, Talbot hounds. Talbot hounds were first brought into England in the 1000s and were possibly descendants of Greek hunting dogs. This means Beagles have had to hunt in their blood for a long time, and probably really like olives. The modern beagle can be traced back to a pack of beagles bred by a Phillip Honeywood, an English reverend, who bred them for their skill at hunting in the 1800s. Beagles were soon brought to America, where they were used for rabbit hunting. The most popular type of Beagle, known as “Patch” Beagles were first seen in the 1880s in New York. These “patch” Beagles gained popularity in the 1950s for their speed and interestingly colored coat. The same year as the creation of the AKC, the National Beagle Club came into existence. This club proceeded to purchase a large space of land in Virginia for the sole purpose of field trials for Beagles. This space is still used today by the National Beagle Club for various activities. 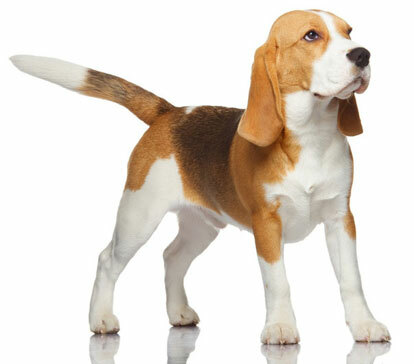 The Beagle was registered a year after the American Kennel Club was created, in 1885. There are various shades of Beagle coats, but the most predominant coat coloring is tri-color, lemon/tan -white, and hair pied. 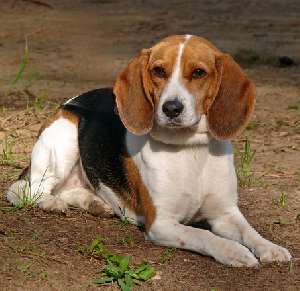 The coloration varies according to genetics, although the tri-color Beagle is most common because of its popularity in the 50s. The AKC recognizes 11 coat colors but only 1 marking for Beagles. Beagles are relatively stubborn dogs when it comes to training, some claiming it taking up to a year to housebreak their Beagles. It is easiest to take a Beagle to obedience classes than trying to train it personally. Being especially sensitive to criticism, Beagles do not handle negativity well. Positive reinforcement is the best way to train a Beagle, or else they will become stubborn and reluctant to learn. As well as taking Beagles to obedience classes, it is important to expose them to many different environments, people, and animals. Early exposure will make them less likely to react negatively or quite as loudly to things. The phrase, “All bark and no bite,” is quite an accurate description of a Beagle’s personality. Beagles are far too friendly and small to be anything substantial in ways of protection. Their tendency to be very vocal about any change in their environment makes them great for alerting of a stranger’s presence. Unfortunately, being alerted to a stranger’s presence doesn’t offer any protection to the owner. If you are looking for a guard dog, maybe a Beagle is not best for you. At the same time, even if you are not too worried about intruders, Beagles are better off not seeing many strangers, as they will cause a lot of noises. A Beagle should not live in a house anywhere with a very high population density as it will be stressful for the dog and the owner. All Beagles have a compact, double coat of short hair. This coat helps wick off rainwater with ease, making them less prone to the “wet dog smell. A Beagle should be brushed at least once a week with a medium-bristle brush, this helps remove leftover dead hair and other residue. Beagles do not shed especially hard because of their short hair, so cleaning up shed hair is not a big issue for this dog, except for in the Spring, when they shed their winter coat. They are not known to be very dirty dogs, so it is only necessary to bathe them about once every month, depending on how dirty the dog gets. A Beagle’s toenails should be clipped regularly enough that the dog does not click its toenails against the ground as it moves. Toenails that are too long may tear and cause the dog a lot of pain. It is important to take care while clipping its nails, as cutting them too short may cut into their blood vessels. For a dog that talks so much, it does not require extensive teeth care. A Beagle’s teeth only need to be brushed two to three times a week. 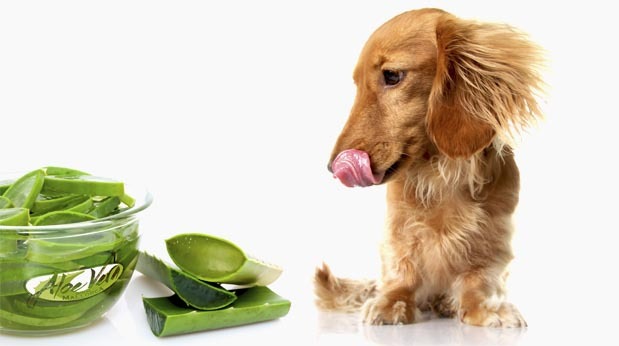 Regular brushing will keep their teeth healthy and their breath not quite as bad, as dog breath goes. 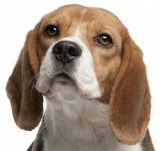 Since Beagles have ears that hang down, there is a higher chance for infection. 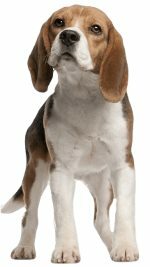 A Beagle’s ears should regularly be checked for excess wax or any sign of infection. Like all dogs, Beagles are more prone to some health issues than others. It is important to take possible health concerns into consideration before buying a dog. Providing great healthcare for a dog is important as well, as prevention is the best medicine. While Beagles are not inevitably condemned to any of these conditions, it is still important to become familiar with them to prepare for any possible bumps in the road. Genetic health issues can be avoided by knowing the breeder as well as the breed. A good breeder will be able to pass health clearances for their dogs, proving their good health. The most famous Beagle of all times? "There's no need to fear--Underdog is here!" Who's Underdog? A Beagle,of course! The Newberry Prize winning children's novel, Shiloh, is about an abused Beagle and the boy that loved him. A great all round resource for all potential and current beagle owners. It is chocked full of information on all aspects of beagle ownership in an easy to read format. This book makes a great reference even if you don't want to read it all at once. Click on the image to find out more!